Soft furnishings shop on North End. It opened in March or April 2016. In the mid-1980s, the premises were occupied by an AA Travel shop; see photo from April 1984, photo from c. 1985. As of 2011 the occupant was a shoe shop called PriceLess Shoes photo. By July 2012 this had been replaced by another shoe shop, called Linvi photo, but this had closed in its turn by November 2012 photo. In November 2012, a clothes shop called Leather Factory photo opened up in the premises. This closed again some time between August 2014 and January 2015. By January 2015 it had become a clothes shop called Fashion Gems photo, but this closed down some time between January and March 2016 photo. 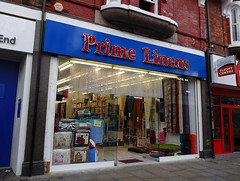 By April 2016 it was a soft furnishings shop called Prime Linens photo. Last edited 2018-07-08 09:39:36 (version 34; diff). List all versions. Page last edited 2018-07-08 09:39:36 (version 34).